Footage From Comedy "Detention Of The Dead"
Eddie: Would you ever go out with a guy like me? Janet: My friends would eat me alive. This is not necessarily a good film, and it is not a surprise to me that the movie has generally low reviews on IMDb. A bit lower than I expected, but maybe it just has not hit the target audience yet. Although, there is a bit too much down time between the jokes to really keep the momentum going, and some of the events go past parody or homage to downright theft (the "Breakfast Club" ripoff where they each explain why they have detention in particular). This might fall under the category of guilty pleasures, though, for zombie and horror fans. There are countless references, and I am sure I did not catch them all: Buffy the Vampire Slayer, Night of the Living Dead, Evil Dead, Twilight and Rocky Horror Picture Show come to mind. 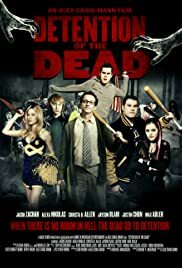 There is an homage to Sam Raimi's directing style, the library is named after effects guru Tom Savini... and in one piece of dialogue, two characters mention all the ways that a zombie outbreak has begun in other films.